Team Canada was at it again, defeating France 4-3 in regulation maintaining a perfect 5-0 record and becoming the first team to secure a quarterfinal position. Jordan Eberle had two tallies for Canada including the third-period game winner in what was a very back-and-fourth tilt. Eberle’s final marker was scored on the powerplay, a huge relief considering France’s 3-3 equalizer scored minutes before was deflected off the Edmonton forward. “It seems like every year there’s a game where you’re in a real fight to get the puck in the net,” said Eberle. “You have to find a way to win, and today we did that with our power play.” Canada had three powerplay goals, outshooting the French 42-21 in Saturday’s contest. In goal, Canada’s Martin Jones – who registered a 17-save shutout during Canada’s 10-0 romp over Germany – recorded his second start. Entering the match Canada led the tournament with 28 goals in four games, Tyler Seguin adding to this total with two tallies of his own. Dallas Stars teammate Jason Spezza assisted both markers. Seguin’s first goal came at 11:26 in period one to open the scoring, Eberle making it 2-0 just over a minute later. Outshooting France 19-6 in the opening frame, this game looked like it was sure to be another Canadian blowout. Though late in the period France would tally their first goal, mercifully down one heading to the locker room. But Canada’s pressure continued, Seguin notching his second to close out period two giving Canada a stable two-goal lead after 40 minutes. France, however, was not about to back down. Scoring two goals 35 seconds apart midway through the final frame, 15,300 (mostly Cazech) fans exploded with excitement. 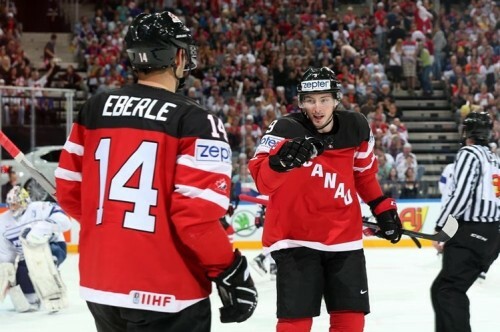 Eberle’s final marker would quiet the crowd, Canada taking nothing for granted.